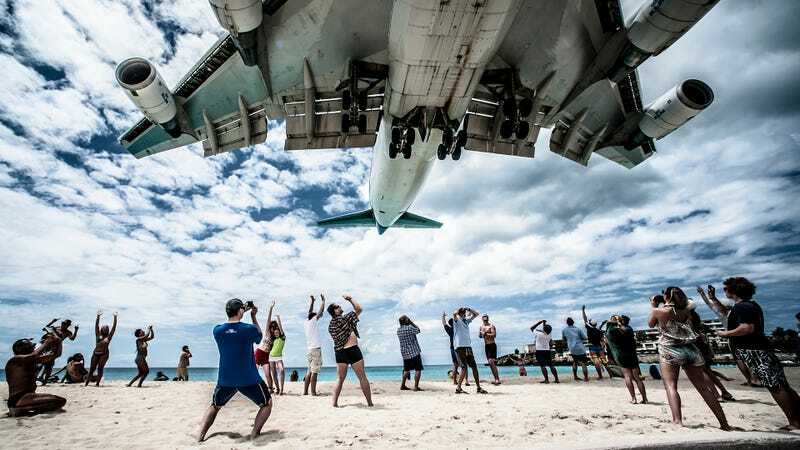 Tourists flock to Princess Juliana International Airport on the Caribbean island of Sint Maarten to catch a glimpse of jets nearly skimming the beach on their ultra-low takeoffs and landings. Numerous signs warn the tourists not to get too close, lest they get blown to their deaths by the landing jet’s air blasts. Guess what happened yesterday? Sadly, a 57-year-old woman from New Zealand ignored numerous signs directly warning her that exactly what she was doing could get her killed yesterday when she held on to a fence as a Boeing 737 took off directly above her. She was blown back from the fence from the force of the plane’s engines, struck her head on concrete and died shortly thereafter, as the New Zealand Herald reports. Watch this video of another tourist back in 2012 also holding on to the fence behind a departing jet at this airport and also getting blown off and also hitting the concrete. You can see how lucky she was to have survived. “I met with the family of the deceased this evening and while they recognised that what they did was wrong, through the clearly visible danger signs, they regret that risk they took turned out in the worst possible way. Aviation commentator Peter Clark said jet blast was “incredibly dangerous”, particularly if someone was standing behind a large aircraft. He said thrill seekers liked to stand by the end of the runway so the jet blast could throw them into the water. Again, here’s what those warning signs look like, even illustrating how you would get blown to your demise. We humans are so small and weak compared to modern jets. Please be safe when you’re traveling, y’all.